The Imperial Theatre opened on April 26, 1913 in downtown Montreal, Quebec. It had a seating capacity of 2,300. In 1934, the Imperial Theatre was rented to Leo Ernest Ouimet and in 1936, RKO Radio Pictures sold the movie house to Consolidated Theatres. In 1950, the Imperial Theatre was first renovated and was altered again for Cinerama in 1954. In 1970, it was sold to Cinema International and was renamed the Cine Centre in 1974. The theater was twinned in 1975 and was renamed the Imperial Theatre in 1976. In 1980, United Theatres (part of Famous Players) repurchased the Imperial and it was restored and reopened in 1981. In 1986, the Imperial Theatre became the first cinema in Quebec to receive THX certification. It was donated to the Montreal Film Festival in 1995 by Famous Players. The Cinema Imperial currently seats 819, and is still a true “Cinema Treasure”. This theatre designed by Albert E. Westover is currently closed for additional restoration (Oct 2003). I remember visiting this marvelous theatre a number of times in the late 1970s and early 1980s when it was used as one of the venues for Serge Losique’s Montreal World Film Festival. 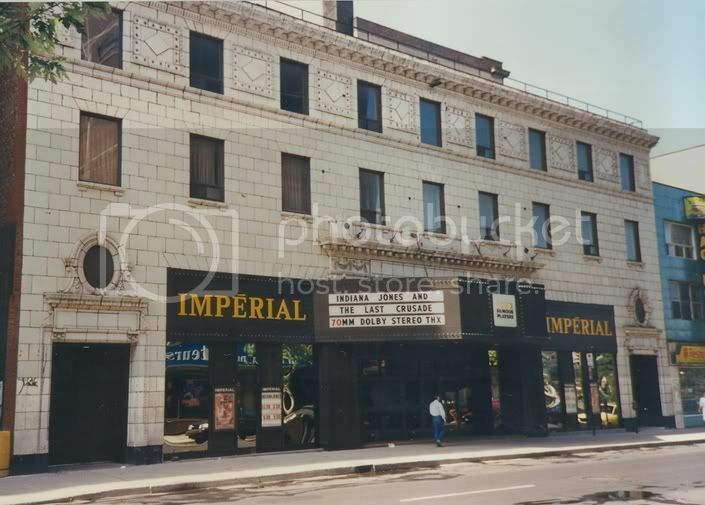 Here is a photo I took of the Imperial in 1989. “The Rocketeer” was presented at the Imperial Theatre in 70mm 6-Track THX Dolby Stereo SR beginning on the film’s nationwide release date, Friday June 21, 1991. Cette réouverture comme Ciné-Centre le 24 mai 1974 avec deux salles de cinéma. annonces d'ouverture de Grand se trouvent dans la section de photo pour ce cinéma. This reopened as Ciné-Centre on May 24th, 1974 with two cinemas. Grand opening ads can be found in the photo section for this cinema. On October 10th, 1975 one of the cinemas continued its adult policy as Eden. Its grand opening newspaper ad can be found in the photo section for this cinema. The Eden did not last long. Pop up in the France-Film listings as Cinéma X on March 4th, 1977. did not last long. Closed? Hydro-Quebec cut power to this cinema.